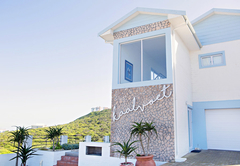 Kaalvoet is a property providing self catering in Yzerfontein for up to 6 guests visiting the Cape West Coast region. 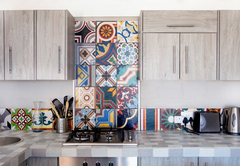 KAALVOET is a fully self-contained luxury apartment with 3 en-suite bedrooms (Fynbos, Seashells and Ocean) accommodating between two and six people. 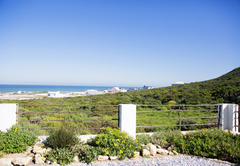 It is only 150 meters from the ocean with a beautiful view of the Pearl Bay beach as well as the fynbos area adjacent to the house. Don't be surprised if you are entertained by a visit from one of our local ostriches or francolins and if you are lucky, you might even spot a Caracal/Lynx (Rooikat). 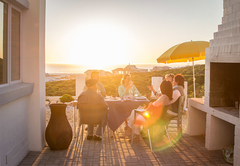 Yzerfontein is well known for its stunning sunsets. 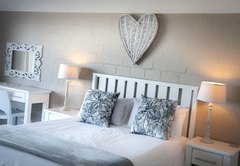 A booking for two people includes the FYNBOS room and the self-catering living area and kitchen. 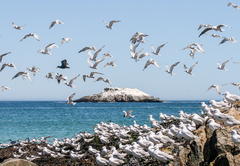 Add the SEASHELLS room for another 2 people and the OCEAN room for 2 more people (additional fees apply). 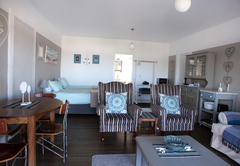 Fynbos is fully self-contained, spacious and tastefully furnished. 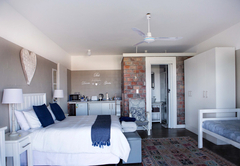 It has one private bedroom with a queen-size bed, fully equipped kitchen and small lounge area with a fireplace. 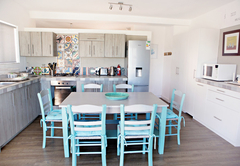 The open-plan kitchen area has an oven, stove and dining room table and chairs. 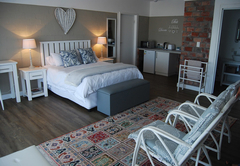 Seashells is an open-plan, luxury room facing the ocean and has a king-size bed (accommodates 2 people). 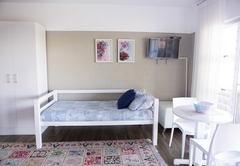 The king-size bed can be converted into two single beds on request. 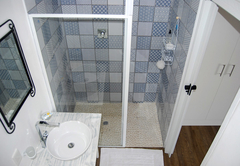 There is a private bathroom with a shower and spacious seating area. 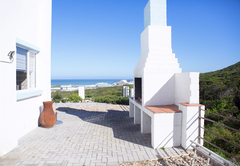 It is equipped for semi self-catering with its own kettle, microwave, small fridge and a patio with a table and chairs. 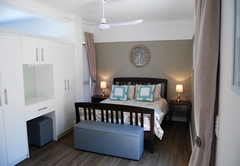 Ocean is an open plan, luxury room facing the ocean and has a queen-size bed (accommodates 2 people). 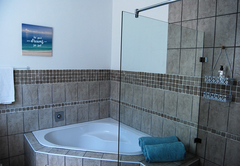 There is a private bathroom with a shower and spacious seating area. 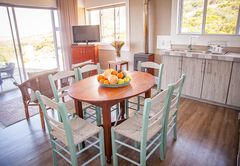 It is equipped for semi self-catering with its own kettle, microwave, small fridge and a patio with a table and chairs. 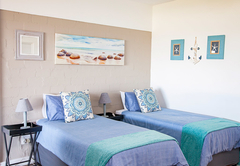 We offer TV with DSTV, free Wi-Fi and parking on the premises. You also have a private barbeque area adjacent to the house. A cleaning service can be provided on request at an additional cost. 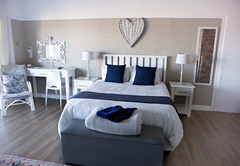 We look forward to welcoming you at KAALVOET! Response timeKaalvoet typically responds to requests in 5-10 minutes.